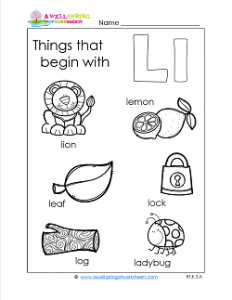 There are six things that begin with l on this awesome worksheet: lock, log, lemon, lion, leaf, and ladybug. Help kids notice the beginning letter by first of all pointing out to them that each word starts with the letter l. Have them put their finger on each letter going from one word to the next. Have them say the words with you, giving extra attention to the l sound and/or by repeating the name of the letter l. Then have them circle each letter l and color the page.